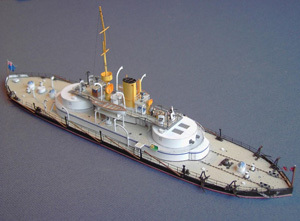 The Paper Shipwright from Cambridge England has been selling buildable paper models of Victorian era ships and warships since 1999. The models are the brainchild of British designer David Hathaway. From his early interest in Victorian warships, which can be called "beautifully ugly little ships", he has branched out to other designs, including British and Welsh lighthouses. There is even a section of free downloads, including the HMVS Cerberus.